The Category Index is a widgeted page where you can showcase your post categories. Perfect for featuring your recipes, stylish outfits, DIY projects, and more! The Category Index makes it easy to beautifully show the categories you blog about most and make it easy for visitors to browse your content. Click here to view a live example of the category index page. Keep in mind the page will display a bit differently in different themes. Create a new page in your Wordpress dashboard at Pages > Add New. In the right column, find the Template section and choose "Category Index" from the drop-down menu. Publish the page. 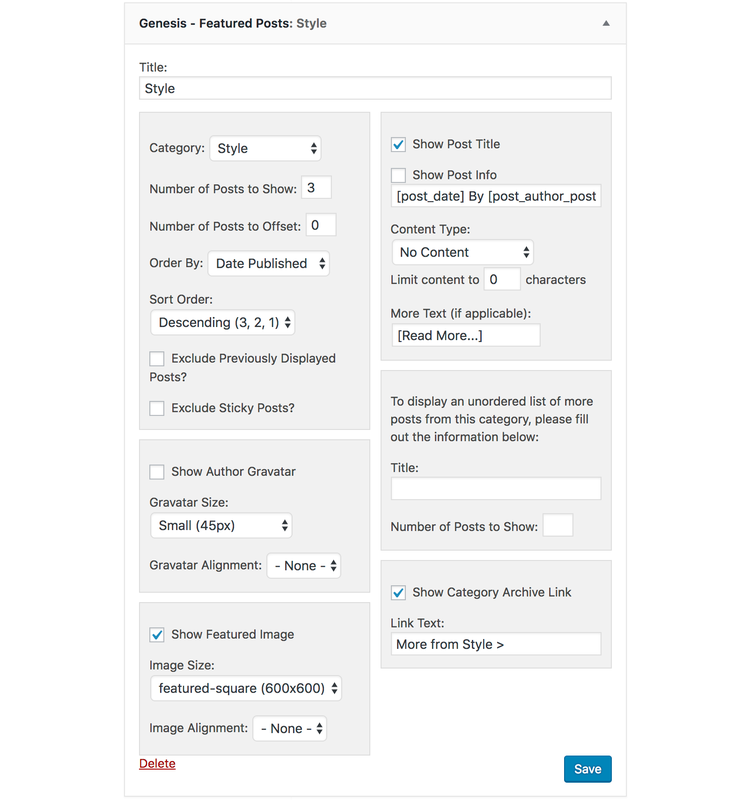 Drag a Genesis Featured Posts widget into the Category Index widget area. Configure the settings as shown below. You do not have to use the category shown in the screenshot — you can use your own! To showcase multiple categories, repeat adding Featured Posts widgets to the Category Index section. Our demos usually feature 3 categories, but you can add as many as you'd like! You can use any image size you would like for the category index – you don't have to use the size shown in the screenshot. We just recommend selecting an image size that is at least 300px wide for optimal display. Our themes only support one category index page. It is not possible to set up a second category index page with different widgets.